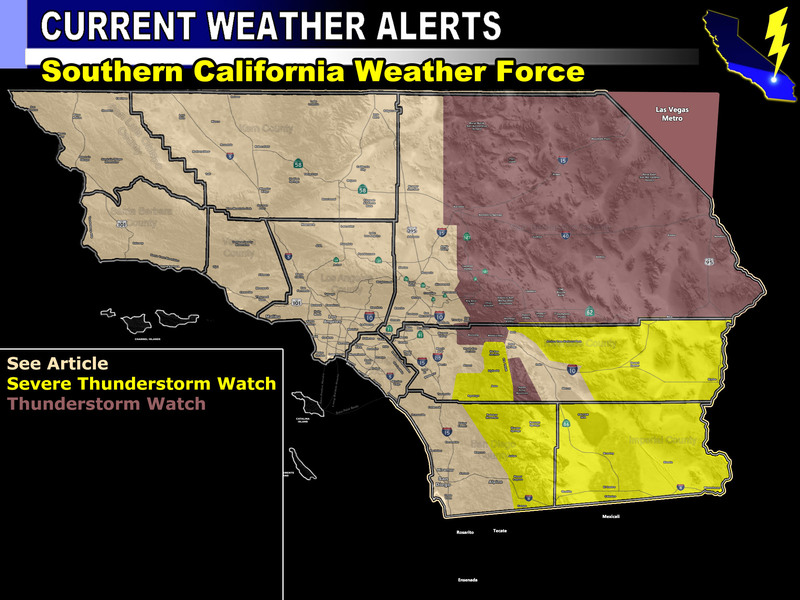 Forecast: The Martin Storm Diamond has been activated and the center of the upper system (Pacific Storm URSULA C3) will pass the northern part, putting a large part of metro Southern California within the thunderstorm risk zone, some areas seeing numerous lightning strikes and some isolated. The Martin Storm Diamond is a diamond-shaped area offshore that I discovered does, in fact, give the best chance of widespread thunderstorms to our region if instability is present, which it will be. Thunderstorms have already erupted in the thunderstorm watch to the west in Ventura and Santa Barbara County so this looks good. Given what I see the most rain and thunderstorm activity will mountains south to the metro basin/coastal/valley zones, however the risk of thunderstorms in this unstable air will extend as far as the Antelope Valley and Metro High Desert zones from Hesperia to Barstow as well. There is also a risk of waterspouts to weak tornadoes at the coast of Los Angeles, Orange, and San Diego County where my Waterspout Watch is shaded … Other than that.. the system is not much of an ‘far inland’ tornado producer but CAN have funnel clouds spotted during the day.